NEW YORK (AP) ― The next time you see birds flying in a V, consider this: A new study says they choreograph the flapping of their wings with exquisite precision to help them on their way. 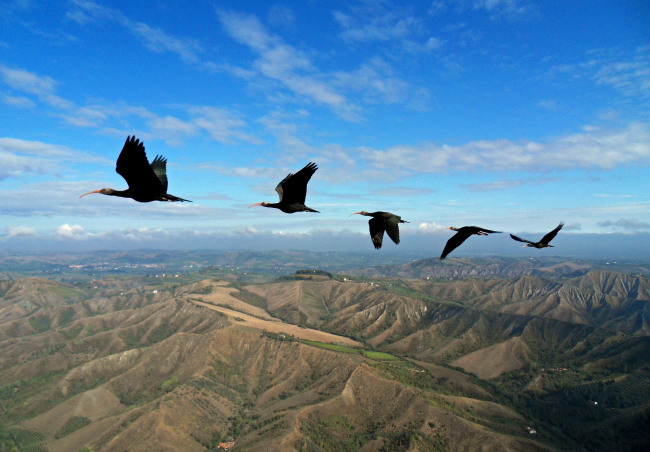 That’s what scientists concluded after tracking a group of large black birds ― each equipped with a tiny GPS device ― that had been trained to follow an ultralight aircraft. One expert in animal flight said just gathering the data, which included every wing flap, was a remarkable accomplishment. The scientists reported their results online Wednesday in the journal Nature. It’s the first experimental evidence that birds can adjust their flapping to take advantage of the wake, Florian Muijres and Michael Dickinson of the University of Washington wrote in an accompanying commentary.